Pink oyster mushrooms are arguably one of the coolest looking edible mushrooms. For many growers, their color alone is enough incentive to grow them. These mushrooms can range from light pink to hot pink with their color fading as they age. In some large clusters, pink oysters may lack this pigment altogether, and it does not carry over after the mushrooms are cooked. Their unusual color makes pink oyster mushrooms easy to tell apart from any potentially poisonous lookalikes. Even their spores can be pink. 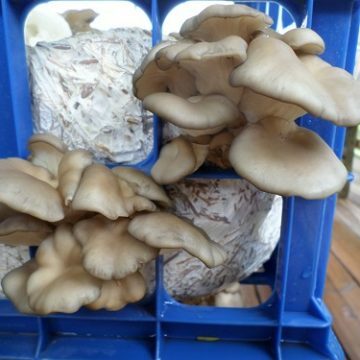 Whereas the blue oyster is known for thriving in especially cool temperatures, the pink oyster mushroom is just the opposite. 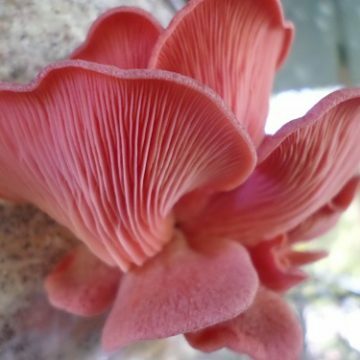 The pink oyster mushroom is extremely widespread in pan-tropical climates. 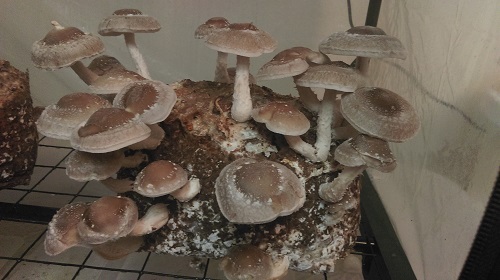 Pink oyster mushrooms perform best in temperatures between 70 and 85 degrees Fahrenheit where they grown on hardwoods such as bamboo and palm trees. In proper conditions, pink oyster mushrooms can grow extremely aggressively. 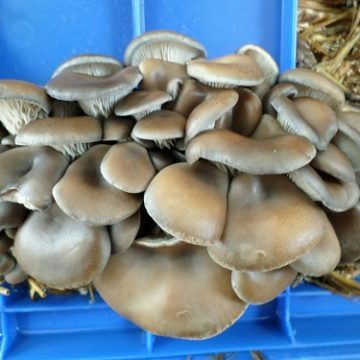 Pink oyster mushrooms have even been known to colonized unpasteurized substrate before any type of contaminant can take hold. These properties make them ideal for new growers because they can offer some forgiveness if proper pasteurization or sterilization is not maintained. Pink oyster mushrooms are ideal for outdoor growing in the peak of the summer when other mushrooms may not be able to handle the heat. 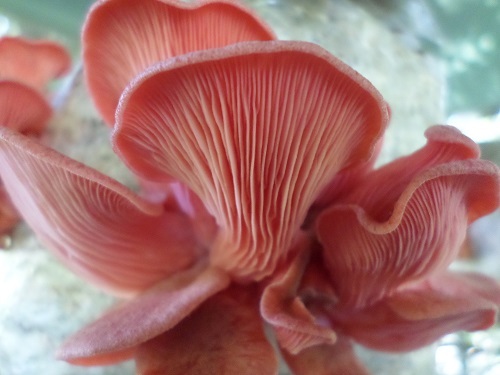 Pink oyster mushrooms can be spawned on most grains such as rye berries, wild bird seed and even cardboard. 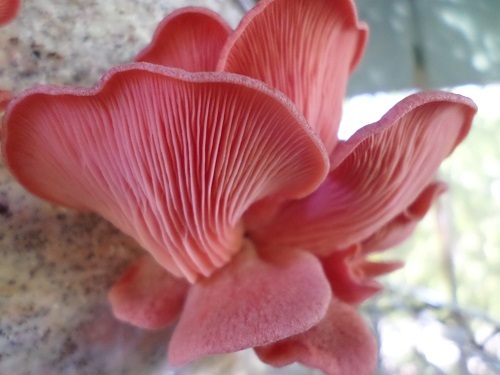 Like other oyster mushrooms, pink oyster mushrooms will grow on a wide range of substrates. 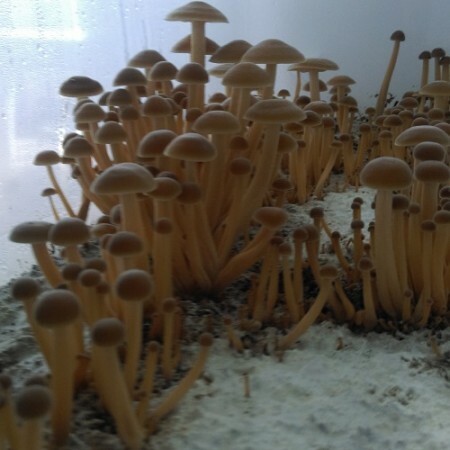 But they can be grown easily and cheaply in great quantities on straw using the laundry basket Tek as featured in the Let’s Grow Mushrooms video. Each item contains one petri dish with a pink oyster mushroom culture culture colonized on MEA substrate.